Real-life UX: What's wrong with our coffee maker? At Stack Exchange, we have a very expensive espresso machine - professional quality. However, we are having a persistent, companywide problem with its use. It seems that after using the wand to steam your milk, you have approximately 5 seconds to wipe the wand with a damp rag before the milk crystallizes on the wand - because the wand is extremely hot from the steam passing through it. And after this happens, it's very difficult to clean. In the picture, it appears the wand has been partially cleaned already. It's such a problem that we have resorted to a regular announcement every two weeks at our town hall meetings to "Clean the wand!" My position is that this is a UX fail, and the need to give extra instructions is a sign that you've failed with the design. Even though it's an extremely expensive piece of equipment, the designers just failed to think through the use cases. Why is it necessary to have to wipe the wand at all? Most of my colleagues take the position that this is a professional grade machine and that we are using it incorrectly by not having professionals operate it. Essentially, the problem could be solved with more training. Is this a UX problem, and how could the machine be altered to avoid this problem, if so? Hire a barista to man the coffee machine daily, justify the cost by explaining each employee saves 5+ minutes per day not making coffee. Develop a disposable stirrer/steam nozzle made of high temperature plastic, you need to connect one to use the steamer and it detaches and is used for stirring the drink then disposed (probably expensive). I would opine that this is like asking how tires could be improved in such a way as to not get dirty after driving through mud. With currently available technology and physics being what they are, I have to say this is a behavioral issue rather than a design issue with the wand itself. I agree with your colleagues. Any good coffee shop will keep two clean, wet cloths (bar towels) by the station, one for cleaning the machine and one for wiping the steam wand. Cleaning and purging the steam wand after is essentially barista 101; if you don't know to do that and have no one around to guide you, you probably shouldn't be operating a professional coffee machine! This strikes me as more of a technology problem than a UX problem, per se. When milk scalds, the proteins denature and they will happily adhere to pretty much any surface, so milk residue is a necessary evil when a hot surface makes contact with milk. You can eliminate most of the build up inside the nozzle by purging it with a blast of steam after you take it out the milk; perhaps, if this was combined with some method of applying water directly to the nozzle, you could have an autoclean button that would take care of most of the outer stuff if you did it before it had a chance to crust up. I can't quite think of an effective way to do this that would circumvent the need for some extra cleaning later, however. This is not a design or UX flaw for a simple reason : when designing this machine, designers expected users to be professionals with both enough training and enough time to take care of it. But you're NOT. You're just casual users who want to have some coffee as simple and as fast as possible. So maybe it is your own fault for not having the right machine for the right users. Being "very expensive" and "professional quality" does not always mean to be the best fit. IMHO, you should replace this machine with simpler coffee maker(s) and/or simpler espresso machine(s). I think the simplest solution would simply be to make the wand retractable into the machine. After use, the wand retracts, the machine washes it with water, and then it re-extends. There are two things that I can think of that might address this. One is to simply make the wand self cleaning or easier to clean (maybe hydrophobic). If option one isn't possible then option two would be to make it look more objectionable when it's not clean (color the wand to make the dried milk more obvious), hopefully prompting users to clean it more often. But neither of these may be technically feasible. The wand is a heated element that's in contact with food and anything that effects the taste would be undesirable. Or perhaps a colored wand would be unappetizing and reduce customer satisfaction. It's probably possible to throw technology at it and include a mechanized automated wand cleaning subsystem, but the increased complexity has obvious downsides. In industrial design technological roadblocks are common and add requirements to the device's operator. Automobile brakes at one point required operator skill to avoid locking up when braking on wet surfaces, but technology has solved that one. Seat belts still require proper user operation in order to work - technology hasn't solved that one yet. edit add: Another possible solution would be to have a pitcher filled with sanitizing solution to be placed under/around the wand so that the wand is immersed in the sanitizing solution. The pitcher would be in place whenever the wand is not in use. The sanitizing solution must be food safe and tasteless. If the pitcher is clear it would be obvious when the solution becomes milky and should be replaced. It might help to label the pitcher "Keep wand Immersed in this." This is probably a safer method than a rag that gets reused and may attract bacteria. As with any system, it's probably both user and UX design problem, depending on how you look at it. 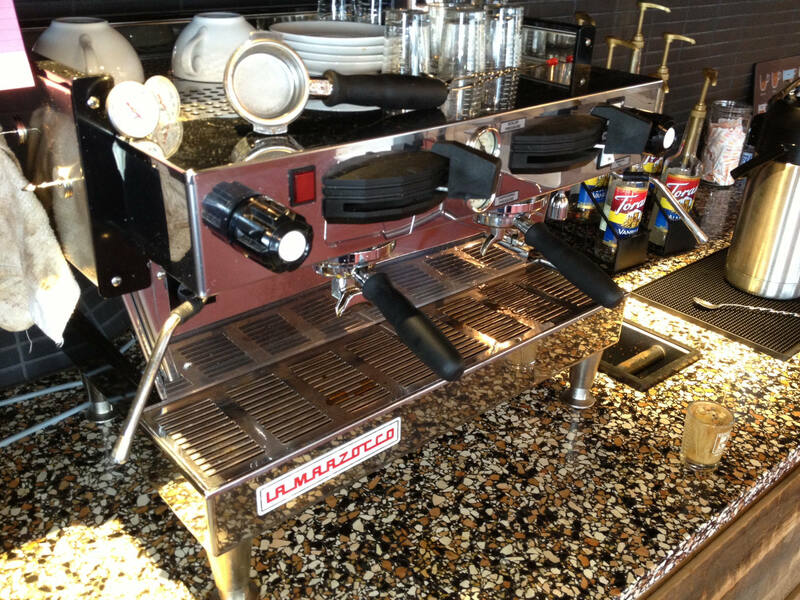 The coffee machine can be thought of as an expert system, where a high amount of knowledge can be expected from the user. However, something being an expert system does not automatically make UX problems disappear, it only means you need to prioritize differently. For example, in a expert system if something is unintuitive but more efficient once you learn it, it's good UX to keep it that way rather than make it intuitive and less efficient. However, best UX would be to make it both efficient and intuitive, if possible. 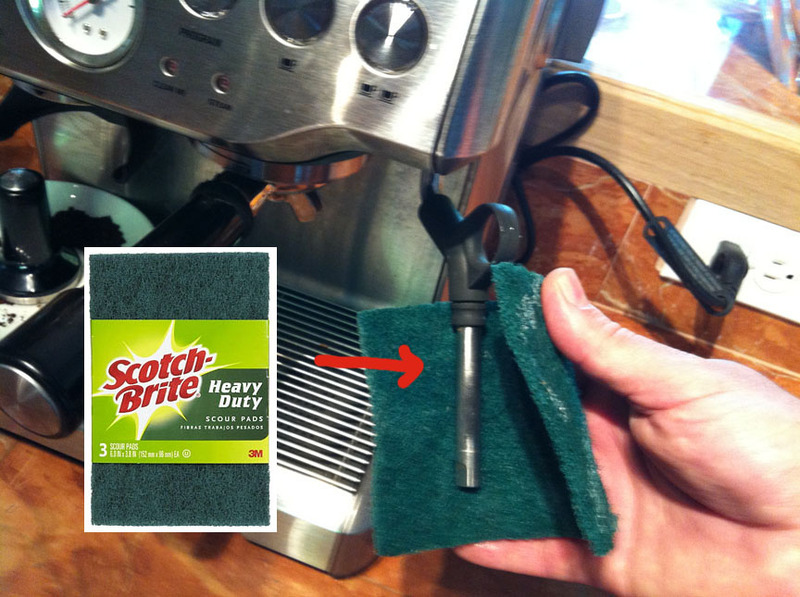 In the coffee maker situation, the most simplest UX solution would be to have a towel nearby so it's easy to clean the wand, and make it very visible and associated with the wand (maybe have a small picture of the wand or such), so that it works as a reminder. In case it's possible to alter the machine itself, it could have a reminder warning light (labelled eg. "clean the wand") lit up right after use of the wand, which would then require an press to be turned off. Or maybe the light could actually be in an external, close-by system that also holds the towel for the cleaning, and the warning light would automatically turn off when you pick up the towel. Of course, the best would be for the wand to be of a material that doesn't need to be cleaned, or that the machine would automatically clean it - but those are technical solutions, and they might not be possible. Or the automatical cleaning might make it less efficient, so in the context of an expert system that would be bad UX. I'm quite surprised at the number of people on the side of this being a user issue. I'm going to throw out my idea for fixing this. Maybe I don't know enough about the chemistry of steaming milk or coffee machines in general, though. However, it seems to me that if the wand was coated with a hydrophobic substance (Teflon was suggested in the comments), but any inert hydrophobic coating would work... food grade wax, spray on liquid glass, or similar and/or make the wand from some substance that doesn't get hot... Ceramic, plastic, or even a metal with a very low heat conductivity like titanium. If milk can't stick to the wand and the wand doesn't get hot enough to evaporate the milk, then there's no possibility of residue. No residue, and there's no need for extra user training, cleaning instructions, or a need for "dirty" towels. Since the model of machine requires a regular wipe-down to stay operable, a functional overhaul is out of the question, so the alternative is to make the desired behavior as simple and intuitive as possible. An aftermarket accessory might do the trick. One solution might be a sleeve and cloth combo on the wand itself. Inner cloth is damp, and fed via capillary action from a small water supply within unit. When out of use, sleeve sits out of the way at the top of the steaming wand. When inner thermometer registers the temperature consistent w/ 15-30 seconds of active steaming, it triggers the LED on the outer sleeve and a little message that says "pull down to clean wand"
What if the wand was very quickly cooled as soon as the steam turned off? I don't know how technically feasible this would be. And if you waited a longer period of time, it would still dry on. But it would avoid the milk quickly hard-drying on. Another solution might involve having the want secrete a small amount of liquid water right after the steam turned off to rinse the wand. This would require some kind of drain pan beneath the wand. Ice cream shops just have a container of water they drop the scoop into after each use. Why can't the same be done here? The residual heat from the wand would warm the water which would be dumped and replaced as needed. It's important to remember to use both a vigorous up-down and rotational movement - you could add a sticker to the machine to this effect. This is definitely a UI problem! The metal gets very hot and the milk gets burned onto it. 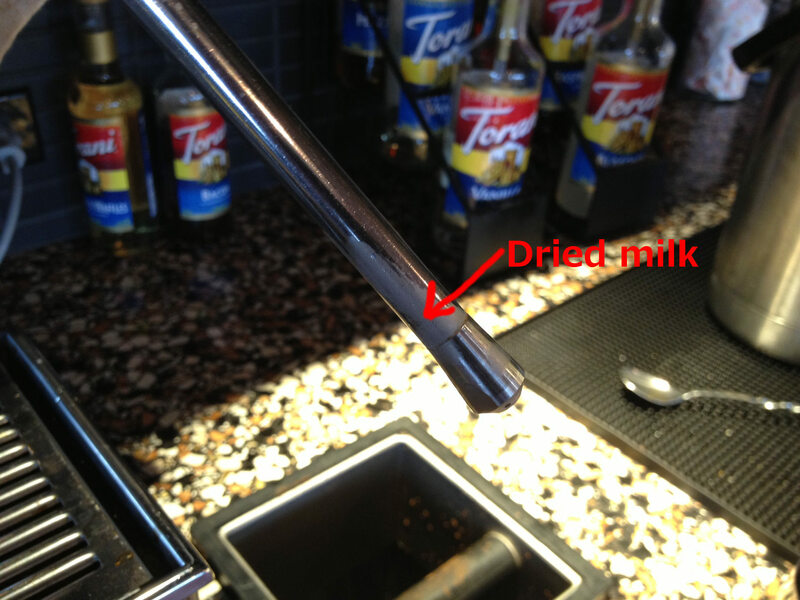 It would be very simple to put layer of teflon (a very high temperature, food grade plastic) around the metal tube that would both decrease how quickly the milk dried on the wand and make it easier to clean off. It is probably possible to buy some teflon tubing press it onto your wand to solve the problem. I don't know the exact size but check out this site http://www.mcmaster.com/#8547K12. Teflon is on the softer side so you might be able to push it on over the head of the wand. Not the answer you're looking for? Browse other questions tagged interaction-design design physical or ask your own question. Do we lose touch with our users? What's the deal with the “Shake to send feedback” on Google Maps for Android? Can Virtual Reality be a Substitute for Real Life Experiences? Designing user experience for an actual, real-life environment (off-screen)? What's wrong with USB sticks that you need 3 tries to plug them in correctly?